If you meet us at a tradeshow or read our website, we talk about the konjac plant a lot (more information here). The Konjac plant (Amorphophallus Konjac) is a fibre rich vegetable and it is also known by many other names such as the konjac potato, Elephant Foot Yam, Devil’s Tongue, or Voodoo Lily. A photo of a whole konjac plant. Sometimes, we are asked about how the konjac is farmed. The konjac plant can grow in various environments, but it grows faster and produces a larger, higher quality root in its ideal setting. The natural habitat for konjac is on mountainous regions 2000 to 4000 ft above sea level. In the best environment, the root of a konjac plant can grow to 1 to 2 pound in three years’ time. In less suitable environments and in the wild, it takes 6 to 8 years for the root to grow to half the size. A konjac bulb about to be planted. 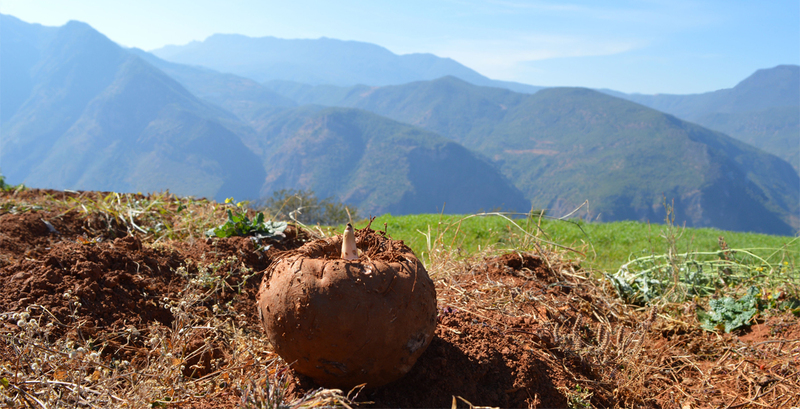 A freshly farmed konjac root overlooking the mountains. Once the konjac root fully matures in the autumn of the third year, the plant is harvested after the plant withers away. Any plant that has not reach maturity is replanted in the next spring. After a three year cycle, the konjac farm is laid fallow or used as a corn field for one year, as the crop rotation helps improve soil fertility. Certain farms plant the corn and konjac alternatively in the same area, optimizing the use of the field. A konjac farm beside a corn field. Konjac and corn being planted side by side. And that is the life of a konjac in a farm. Not long after harvesting, the konjac will be milled and made into various foods, including NuPasta!